Is the illustrator implying addition of Amer Picon to the General’s absinthe cocktail? Would that be a traditional recipe? Maybe sitting on it says something about the House of Picon at that time. Perhaps the feet ‘swimming’ in the drink is simply an allusion to the General’s escaping (by way of English channel) that French decadence you referenced. Classic bathing suit. I want to believe that the French circa 1889 were concerned with sanitation, but I’m not sure I can without research. Maybe the curved tip allowed the utensil to be elevated or hung in such a way as to promote drying, versus a flat position on a table or saucer, thus reducing clean up of sticky table tops (labor saving). Personally one of my least favorite sounds in the world is a spoon or fork sliding off a plate and on to the floor; perhaps a few French shared my bête noire (anchoring mechanism). Amer Picon was (and more recently again, is) another highly-regarded bitter aperitif, though it has an orange flavor as opposed to absinthe’s anise flavor. 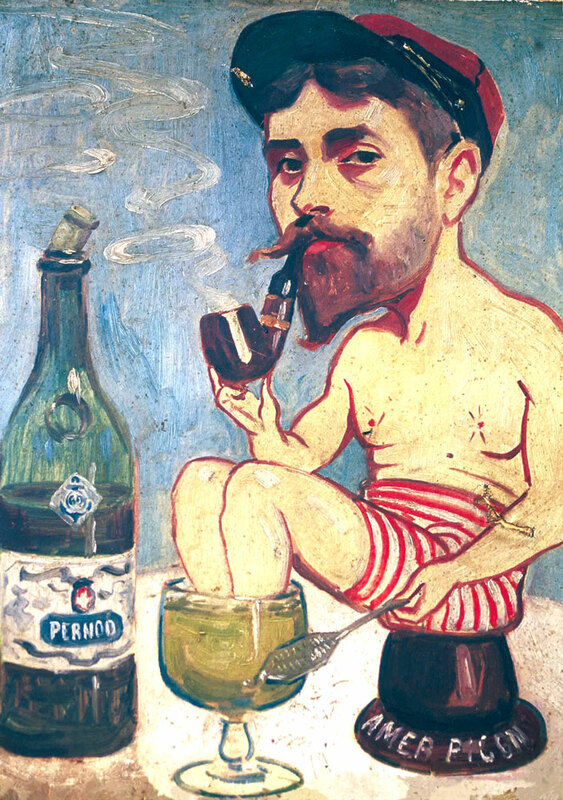 However, I don’t believe this liqueur was extremely significant to the illustrator itself, as it is a pyrogene (French for “match striker”) that the General is sitting on which is branded with the name. Matchstrikers were extremely common on bistro tables, and many of them advertised liquors, liqueurs, sparkling water, and etc. I believe the presence of a matchstriker was primarily to set the scene with all the trappings of a French bistro. Is there significance in the fact that the General is sitting in the matchstriker bowl, (in which the matches were usually dropped in and sticking straight up)? Possibly. An argument could me made that this is symbolic of him having “put the fire out” on his chances to become President (or dictator) of France. and argument which I believe may hold some merit. Of course, it may simply make a handy seat for our “hero” in this satire. That’s an excellent idea about how the spoon could dry more easily being slightly elevated from the table. However, in practice it seems likely that since it is elevated over the table top itself, there would likely still be at least a drop or two of absinthe which would drip down from it. Having been to a number of bars myself over the years, I’m guessing a few drops of absinthe is the least of undesirable things to hit the surface of the average bistro table in this period, so I’m still going to have to go with “sanitation” for the win, ha!